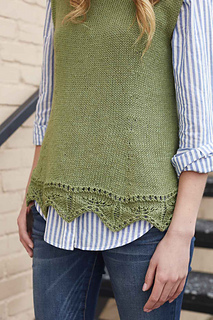 Vertical darts create slimming lines on the Gecko Top, while lace at the hem adds a feminine touch. 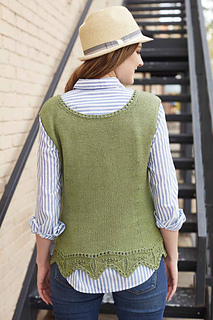 You’ll love the blend of plant fibers and animal fibers in this yarn: it’s breathable and lightweight for multi-season comfort. Finished Size 32.75 (36.5, 40, 43.5, 47.25, 50.75)“ bust circumference. Top shown measures 36.5”; modeled with 3.5” of positive ease. Yarn Berroco Fiora (40% cotton, 30% viscose, 15% alpaca, 10% nylon, 5% wool; 246 yd / 3.5 oz): #3865 magnolia, 2 (3, 3, 3, 4, 4) skeins. Gauge 20 sts and 25 rnds = 4” in St st.
Notes This top is worked in the round from the lower edge to the underarm, then the front and back are worked separately back and forth.